DEVOTEE: Beloved Master, could You speak about Your role as Prophet in the world? 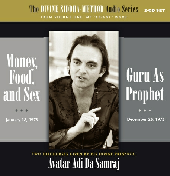 AVATAR ADI DA SAMRAJ: I have Revealed that the intelligence of "radical" self-understanding must already (in the foundationary sense) be established before I can Initiate My devotee into the True Spiritual process in My Avataric Divine Company. Therefore, My Function as the True Divine Guru is (necessarily, and inherently) not a public function. I do not walk down the street and “zap” people—telling them that "life is a fountain" (pretending that everything is already all right), or showering blessings on them, or consoling them, or fascinating them. None of these things serves the crisis of self-understanding that is required for the Real Spiritual process. One who Functions as Guru exercises the Guru-Function only in relation to those who are his or her devotees. If the Guru addresses public society at all, he or she may also (in the public setting) assume the role of prophet—which is, essentially, an aggravation, a criticism, an undermining of the usual life. My Function as the True Divine Guru is not a public function. My Guru-Function is not manifested in the public circumstance. And the public is not invited, as public (that is to say, as those who are not yet My formally practicing devotees), to presume a devotional relationship to Me—as if the True Spiritual process in My Avataric Divine Company were something that a person could merely "decide" to do, or embrace, or believe, and could then go ahead and perform, independent of the formal practicing relationship to Me. Therefore, in relation to the common world, I Manifest only the Function of Prophet and Critic. As Prophet, I do not exploit the seeker's approach to Me. Rather, I Call the seeker to observe the suffering, dilemma, and dis‑ease that is motivating his or her search—whether the search is to take on Spiritual practices and other kinds of disciplines or (otherwise) to exploit the possibilities of ordinary life. My Spiritual Function as Divine Siddha-Guru is essentially hidden, until an individual (having formally embraced the Eternal Vow of devotion to Me) becomes established in the fundamental devotional discipline of turning the four psycho-physical faculties (of body, emotion, mind, and breath) to Me and in the basic life-disciplines I Require of My devotees—and has (thereby) begun to become established in "radical" self-understanding. Only then does it become Lawful, and even Effective, for Me to Grant My Initiatory (and Love-Bliss-Full) Spiritual Blessing to My devotee.